. :: Elica Editions ::: Jacques Brissot ::. 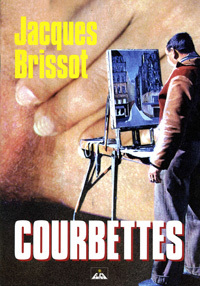 Elica has started its publishing activities with a rather osé artist book entitled Courbettes by Jacques Brissot, whom Elica considers one of the greatest living visual artists. An original member of Pierre Schaeffer's group at the O.R.T.F., Brissot has had an artistic career in film-making, including several documentaries (some in collaboration with Luc Ferrari) and short films for the INA, such as the much acclaimed and visually astounding Egypt O Egypt, for which Ferrari composed the soundtrack. His non-cinematic work has found a form of expression in collage, a technique he mastered to such a high degree as to make his works as visually stunning as the paintings of Bosch, Brueghel, Veronese, Patinir, Delacroix, David and other masters he pays tribute to by 'forging' them, although his actualisation of such masterworks is deeply infused with a lucid critique of contemporary political and social situations. This technique eventually expanded into three-dimensional works as mind-boggling assemblages and boxes. Roland Topor, Jacques Sternberg, François Aubrial and Serge Ganzl are a few of the prominent personalities who have written about his work. This homage to Courbet (a passion shared with Ferrari), whose title also translates as Bows, is his own explicit view on the origin of the world, made with current technologies which lead to a somewhat cruder but always clever result. This project was indeed originally conceived to be reproduced in form of a publication and please note the the contents are graphically explicit. It has been published on occasion of the release of a new Elica CD by Luc Ferrari for which Brissot made the outstanding cover. It is published as a little teaser in anticipation of a planned monumental publication completely devoted to this great master of the third millennium. Stapled 32-page full color book in A5, published in a limited edition of two-hundred copies. The first thirty copies are numbered from 1 to 30 and signed by Jacques Brissot and also contain a unique signed color print from the artist's digital archives.